What could be better than starting your day in the waves with a surf session and an experienced instructor by your side? After the guided session, you can keep the board and catch some more waves. When you are starting to feel surfed out, restore your energies and then get back in the water for your second surf session with an instructor in the afternoon. Again, you can keep the board afterward and ride the waves till the sun sets behind the palm trees of Weligama. Join the yoga class in the evening, followed by a meditation. 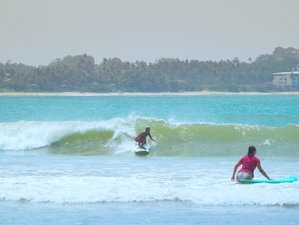 You will be shown how to relax the tired muscles to be fresh for another full day of surfing and fun in the turquoise Sri Lankan waters. Get stoked, stay stoked! Happy Go Island features cozy dorms and double rooms nestled in a lush garden with shared kitchen and common areas. The rooftop has a 360-degree view over the ocean and palm trees. You can stay at the new double room with ocean view and get as close to the ocean as you can get, and with the restaurant just a few stairs away. There are room categories for every budget (double occupancy or shared basis), including two standard double rooms with ensuite bathroom and air conditioner, two double rooms with ocean view, ensuite bathroom, air conditioner, and private balcony, as well as four double rooms with ocean view deluxe with ensuite bathroom, air conditioner, and private balcony. Happy Go Island can also add an extra bed in the private room at an extra cost. Note: Towels are available for rental at 300 LKR per day while laundry is available for an extra charge of 300 LKR per kilogram and there is a 24-hour turnaround. You will start your day with yoga on Happy Go Island's rooftop overlooking the ocean, followed by a surf session in turquoise waters with an experienced instructor by your side to make sure you are safe at all time. After being active, you can relax in the lush garden and enjoy your healthy tropical breakfast with lots of fresh fruits. Then, you can spend the afternoon by the pool, take a stroll along Weligama Beach, or explore nearby attractions like beautiful Mirissa. You will end your day with another yoga session followed by a meditation - sudden experiences of total bliss. New to yoga? Happy Go Island's experienced instructors will be happy to guide you during the lessons. Wanna go for a sunset surf? Board rental is included for your entire stay. You can also swap the morning session with an instructor for the afternoon. Happy Go Island is located directly at the main surf beach of Weligama, a southern Sri Lanka's surfers' paradise, with the ocean just a doorstep away. While staying at Happy Go Island, you will get to enjoy daily healthy tropical breakfast with lots of fresh fruits. The breakfast bar is nestled in a tropical lush garden. As surfing makes you hungry, Happy Go Island invites you to enjoy Lebanese delights and seafood fusion cuisine at our beachfront restaurant The Hummus Bar for lunch and dinner. The catering is also available for dietary restrictions like vegan, vegetarian, gluten-free (open for lunch and dinner). Moreover, filtered water, Ceylon tea, and coffee are free during your stay and you will get your own quality aluminum bottle to carry with you – saves plastic and keeps the beaches and oceans clean. In your free time, you can take a stroll along Weligama Beach to the picturesque Taprobane Island, take a short tuk-tuk ride to the beautiful beach of Mirissa, or take a trip to Galle Fort and indulge yourself in the colonial atmosphere of the city. Treatments like Ayurvedic or western massages can also be arranged individually. Additionally, you can enjoy stand up paddleboarding (SUP) rental and guiding, bike rental, or shopping with a 10% discount at the Happy Shop of fashion, jewelry, and more. Happy Go Island also has a regular event schedule with live music, movie, or barbecue nights that you may join. Flights land in the capital city of Colombo. The journey is approximately four hours by car. You can hire a taxi at the airport or Happy Go Island can arrange an airport transfer for you. They only work with vetted drivers. Taking a train in Sri Lanka is all part of the experience. They give you the chance to really experience the culture and mix with the locals. Weligama is on the Colombo to Matara train line. Six train stops are available here daily. A one way ticket to Weligama will run you 190 LKR. Happy Go Island creates surf camps in a perfect holiday place where people are happy and feel like family so they would wanna come back over and over again.